Check out one of Sir Francis Drake's 'regular haunts'! 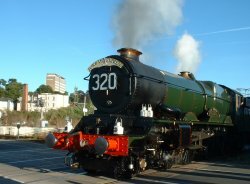 There are a lot of pubs and Inns within the Exeter area, many serving food as well as beverages to a wide selection of clientele. The city centre can get fairly busy on Friday and Saturday nights with pub and club goers starting their evening out at the popular central venues. Many celebrating, partying and enjoying the evening whilst working their way around the town en-route to one of the nightclubs. The less centrally based public houses provide a more sedate atmosphere for a relaxed and laid-back evening to catch up with friends and family. The Exeter Quay is popular for all by day and night. By day, if the weather is right people can sit outside and watch world go by. 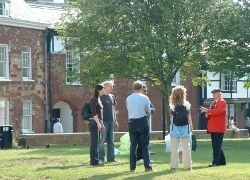 A selection of entries taken from the ExeterViews.co.uk Pubs and Inns Directory. 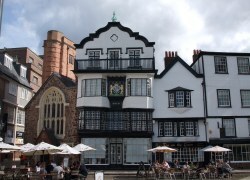 Pub located on Queens Terrace right next to the Clock Tower between Exeter College and Central Station. Turf Locks public house on the canal side. Public house in New North Road, Exeter.